2016 UPDATES New custom cedar board on board fence and gate 2017 UPDATES New roof, exhaust fans, Gutters front and back, Exterior paint,Samsung dishwasher, Interior paint, upgraded carpet with thick padding. Backyard fountain stays with house. McKinney is a great place to raise a family. From its award winning schools to its hometown charm in the downtown McKinney square, it has so much to offer. We chose Stonebridge Ranch because is a wonderful community to live in. We love the walking/bike trails, parks, beach club, and golf courses. Grocery stores and restaurants are all close by. We feel a sense of safety in our neighborhoods which is a big plus, especially when raising kids here. If you ask why we love our home we would have to say the amount of room it has. It is so spacious and open and light, especially the family room and kitchen. The kitchen is wonderful with a huge island and double ovens which come in handy for holiday cooking. When we have parties people end up gathering around the island eating and talking, it’s a great kitchen for entertaining. 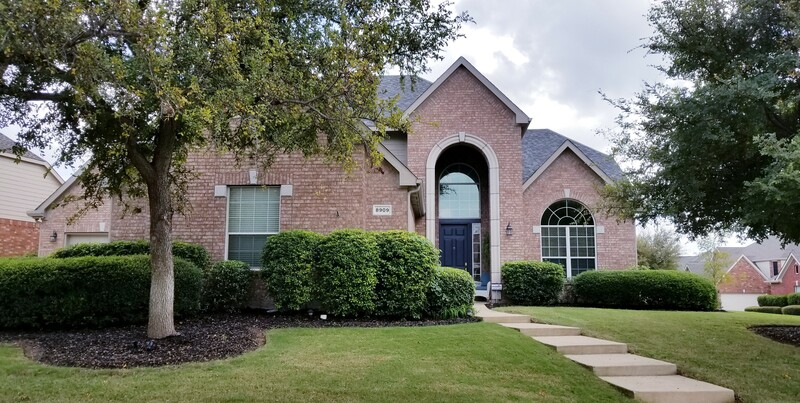 Another favorite part of our home is the backyard; it has an oversized custom patio with lots of shade trees and a beautiful fountain, it’s a relaxing place for morning coffee and evening barbeques. Our neighborhood is full of families from young to old. Everyone walks their dogs, kids play outside, families ride bikes and we all wave to each other or stop to chat. Like we said, great place to live!